Synopsis: On her 30th birthday, Cheng You Qing (Ariel Lin) received an email on “the symptoms of premature aging” from Li Da Ren (Bolin Chen), her best friend of 14 years. Unable to accept that Li Da Ren is like a fine wine that will get better with age and she is like a grape that will dry into a raisin as years go by, she made a bet with Li to see who will get married first before they turn 35. As she looked around for a potential husband, she discovered that she was surrounded by unacceptable candidates, like a gay assistant or a cheating ex-boyfriend. The only man who could love her despite her ill temper and stubbornness is her best friend. The only problem was that they both swore that they were not or will ever be romantically attracted to each other (Pic & Synopsis credit: Wiki). Jeff: Not something I’m watching, but the storyline does seem interesting. I wonder how the chemistry between Bolin and Ariel will be? 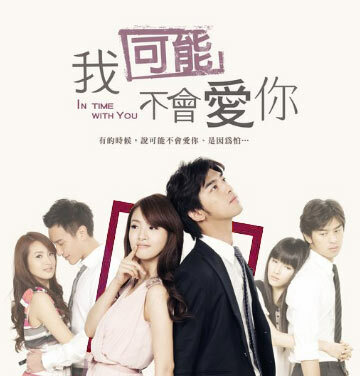 This entry was posted in Drama Episodes and tagged Ariel Lin, Bolin Chen, In Time With You, Twdrama by mochi. Bookmark the permalink. Thanks so much to all the uploaders! Ariel Lin is my favorite t-actress 🙂 Am so glad to see that this is not the last ever for her. Will nip over and send my thanks to Zenith and Viki too 🙂 Also, it looks like I’m not alone in having difficulties uploading episode 4 – did anyone have any suggestions on where to find it? I’m so thankful for all the hard work – none of these air in my country, so the web is the only way I can see them – I’m so glad for all the generous folks who take the time to put these out there – I know it’s a ton of work! Thank-you!!! Pls re-upload ep 4 and 10. The link is dead. Thank you. Not working anymore T_T please re-up them…..
Or maybe, does anyone knows where else we could find them? @Nutella what are Hilang versions? Are they softsubbed as well? @Lynn – i think Hliang ver is just the type of video, i think it is the video that includes television advertisements. Episode 5 has dead links too. @Nutella, I want mp4. Jumbofiles okay as long as they don’t have maintenance. Hi, thank you for re-uploading the files. How do I combine these files? Thank you for re-uploading these. I really enjoyed watching it. It share certain similarities with 9 ends and 2 outs, so if anyone like to watch a set-up like this one, you might want to check that out. Thank you so much for sharing this drama!! why there are always 3 parts of every episode? is part 1 the whole episode? or do i have to download all three parts? One episode is split into 3 parts. That means you have to download ALL 3 parts. Combine them with a program. And voila. wow thank you so much for sharing! where ep 4 part 3 ??? thanks so much for uploading this series. I am having problem with downloading ep 4 part 2. It seems like its not working for me. Thank you so much for providing with the alternative link. That helped alot. ep 2 and soft sub doesnt match…. I synchronize srt ep 2 by using SubtitlesSynch. it’s so easy to use. hope this helps.